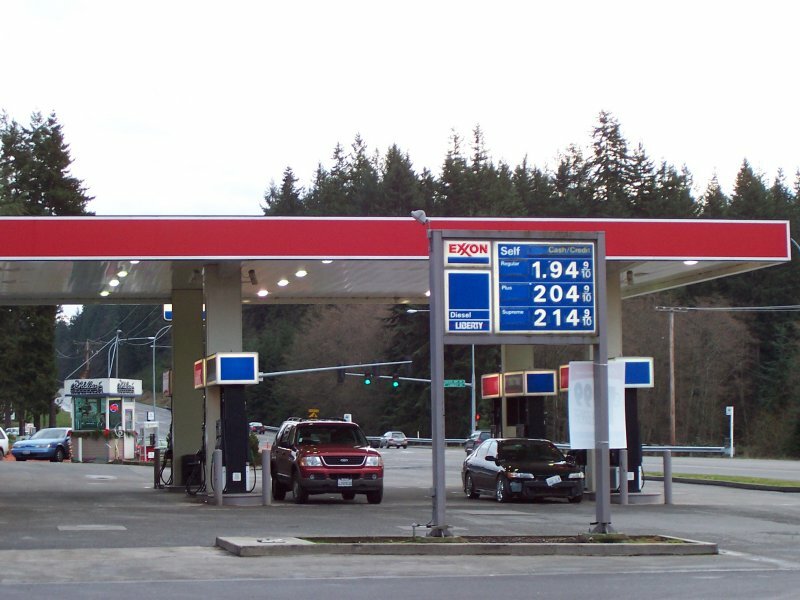 Photo of Naomi's Exxon, located 3 miles west of Clinton, Washington on Whidbey Island. Located at the intersection of Washington SR-525, Langley Road, and Cultus Bay Road. 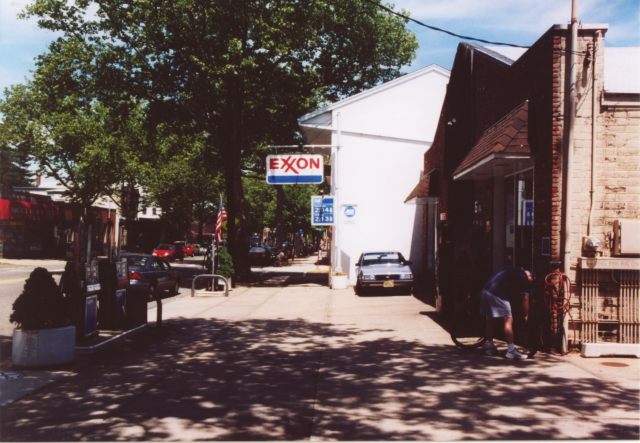 Has been an Exxon station since the late 1970's. 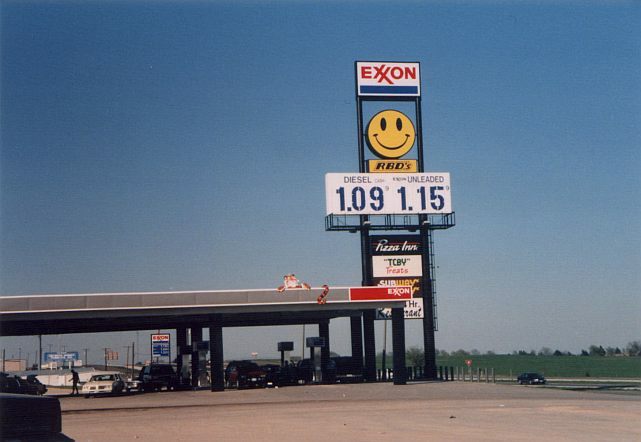 Went through a major remodel in 1995 to install the current pumps, and during that time the area where the Price Display is now, temporary pumps were installed, and removed as soon as construction was over. Naomi's also sells Kerosene, using a standard fuel pump, located on the far side of the building. 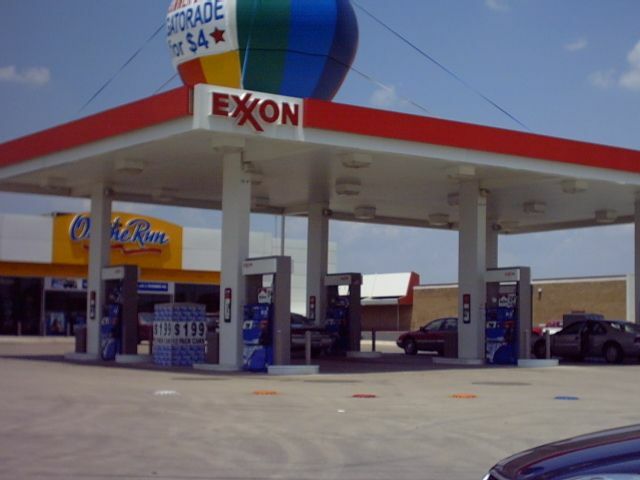 Two shots of an Exxon on I-35, possibly exit 346. Near the town of West, Texas. Taken March 22, 1997 by Sonya Cirillo. 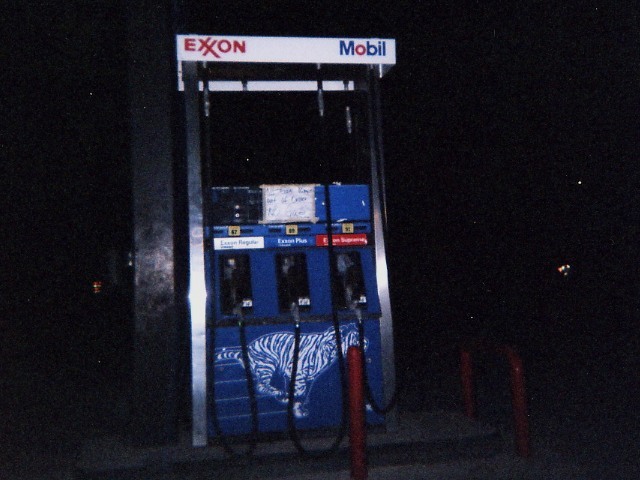 A dual-branded Exxon-Mobil pump with the tiger graphic. Location is Roma, Texas. Taken in Oct. 2004 by David Aldred. the intersection with Walter Ave., Hasbrouck Heights, New Jersey. Photo taken May 20, 2004 by Jeff Alterman. 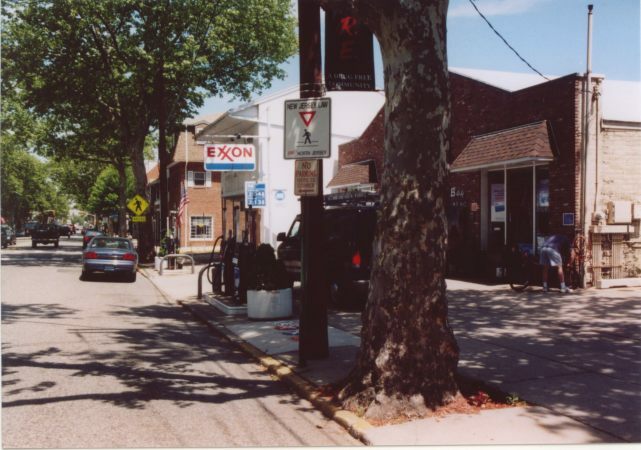 Two more shots of the above curbside Exxon in Hasbrouck Heights, New Jersey. Photos taken May 20, 2004 by Jeff Alterman. 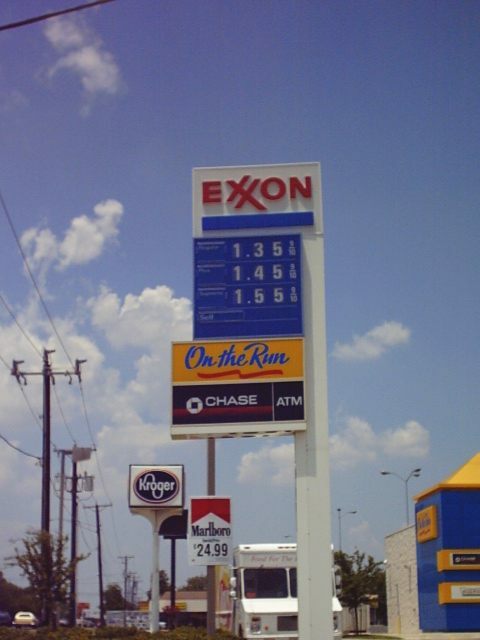 Exxon in LaGrange Texas. Taken Dec, 2003 by David Aldred. 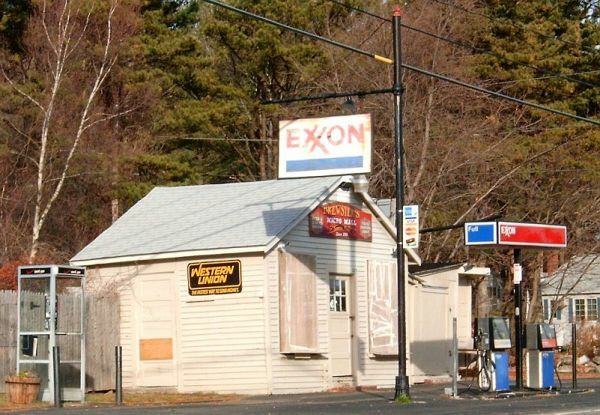 Exxon station in Gray, Maine. From Charles Hathaway. Taken in 1998. 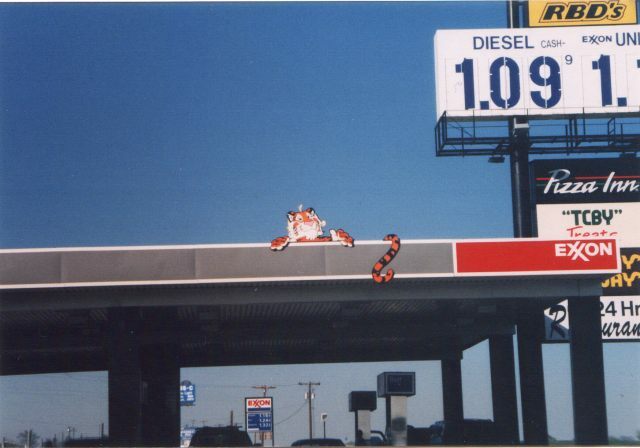 Exxon in Ukiah, California, decked out for the holidays. From Charles Hathaway, taken December, 1998. Brewster's Mini Mall, southern Maine on US 1. 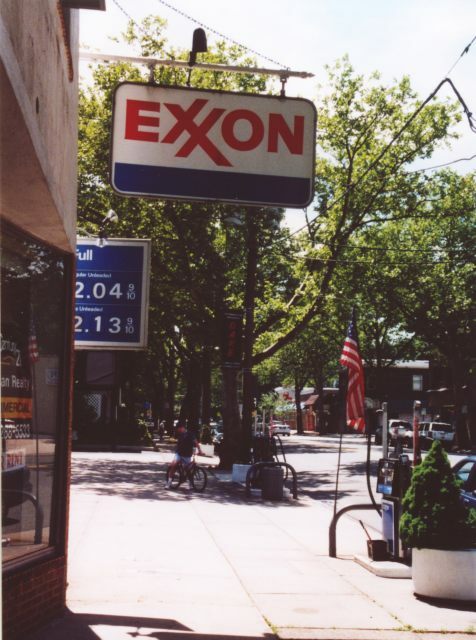 Not often you see a wooden Exxon sign. 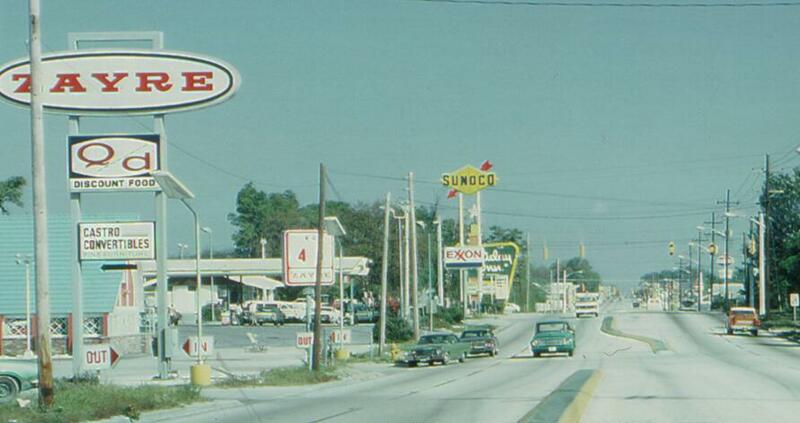 Lakeland, FL 1974. The Exxon station is now a Hooters, the Sunoco a coin shop, the American at far right is an Amoco (for now), the IHOP is still there, and the Holiday Inn (minus the sign). Donated by Robert V. Droz. 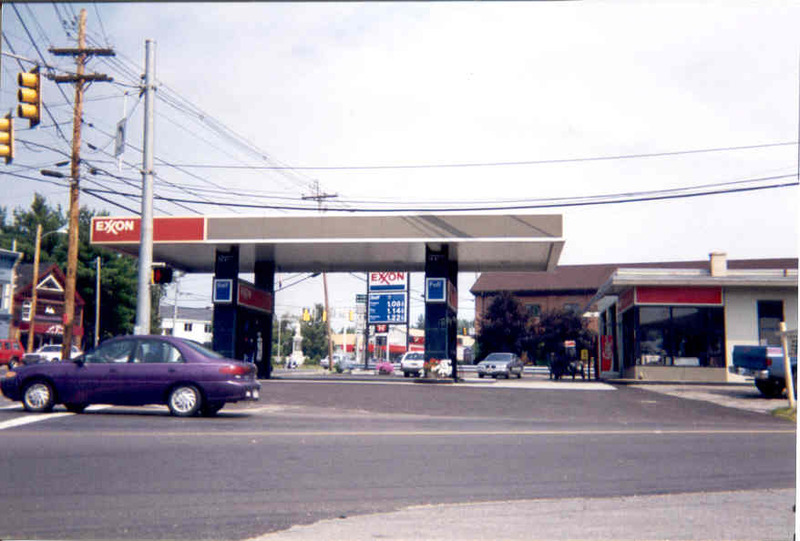 Here is a picture of an Exxon station in the Norton Shores area in western Michigan. 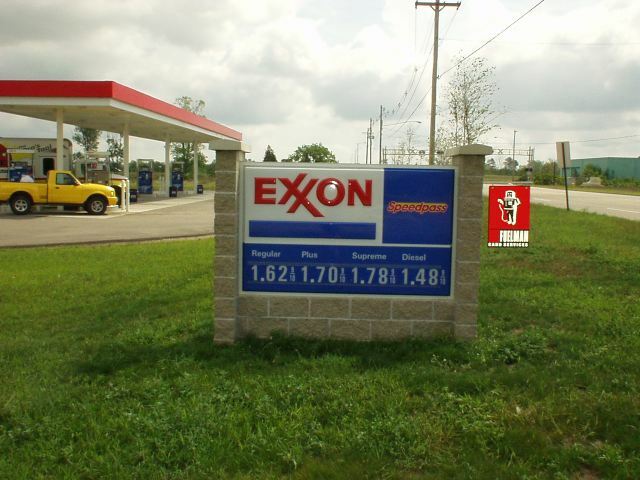 There is nothing spectacular about this Exxon station, only that they have recently begun marketing in Michigan. To my knowledge this is one of three in Michigan at this time. 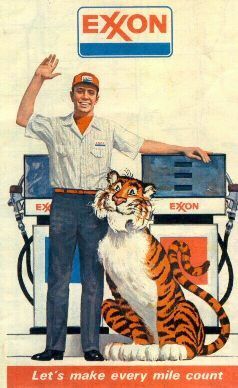 I think since the Exxon/Mobil merger was when Exxon started marketing marginally in the Midwest. World Oil Company at Sunland Boulevard and San Fernando Road in Sun Valley, CA. 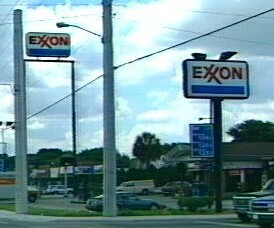 The blue World and globe logo on the side of the building are the same as the signs and gas pump stickers when World was selling its own brand. 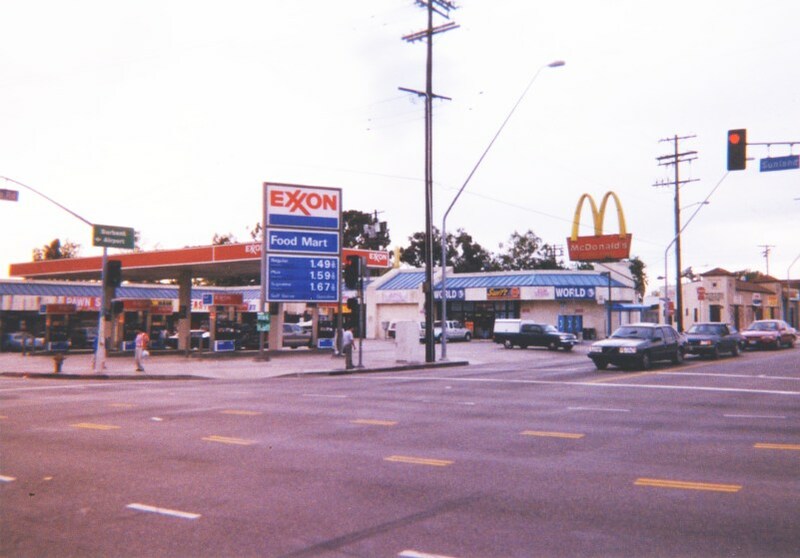 A few years ago, World agreed to market Exxon exclusively in the Los Angeles area. 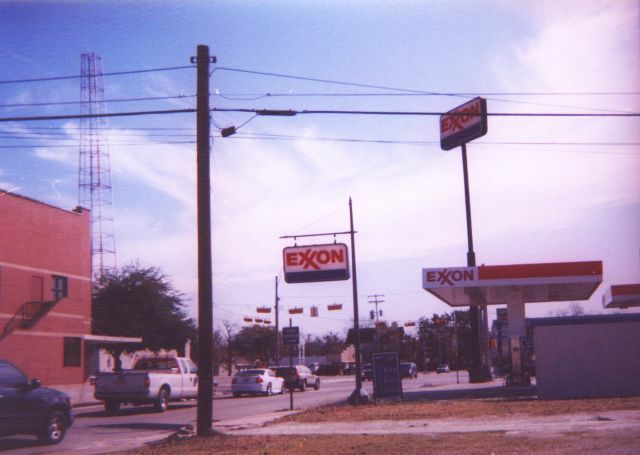 Two photos of an Exxon at Broadway and Denton Highway (377) in Haltom City (Fort Worth) Texas. This is an old station, formerly full serve with service bays. It was closed for quite some time, then was remodeled as you see it now. The building in the background of second photo is a closed K-Mart. Photos taken July 3, 2003 by John Cirillo.